a little nagging of dread. it is your first bond with the wilderness you are going into. What you are doing is exploring. but of yourself in that place. for nobody can discover the world for anybody else. we cease to be alone. Five good things, I tell my daughter as she leaves for school. Because the weight of Twelve drags heavy on her shoulders lately, especially in the mornings, more of a burden than the overladen backpack middle school requires. See if you can see five good things as you walk to school this morning. Earlier, I had a few free seconds with my cup of coffee before everyone woke up, so I glanced at the newspaper. Before I even realized what I’d started, I was halfway through an article about the Family Room set aside for private mourning in a building across the street from Ground Zero, about how, over time, it organically grew to be a sort of shrine: grief made tangible. The photograph of that room, full of objects and images of loved ones, was unbearable. I realized that this morning I might need that quest for five good things as much as my daughter, who’d told me her Instagram feed when she woke up was a succession of burning buildings. I shut the laptop and went for a walk. A smattering of dried leaves in a brushstroke on the sidewalk: fall is coming. 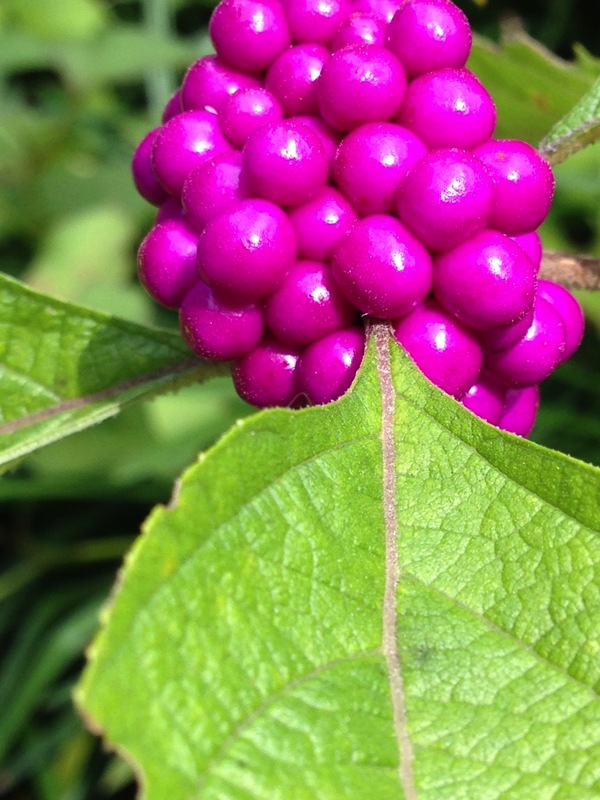 The clump of beauty berries at the side of a neighbor’s house, so hazardous in its purpleness — how can any animal dream of consuming them, how could nature come up with them? They’d be more at home with the brightly-colored plastic flotsam in the aisles at ToysRUs. 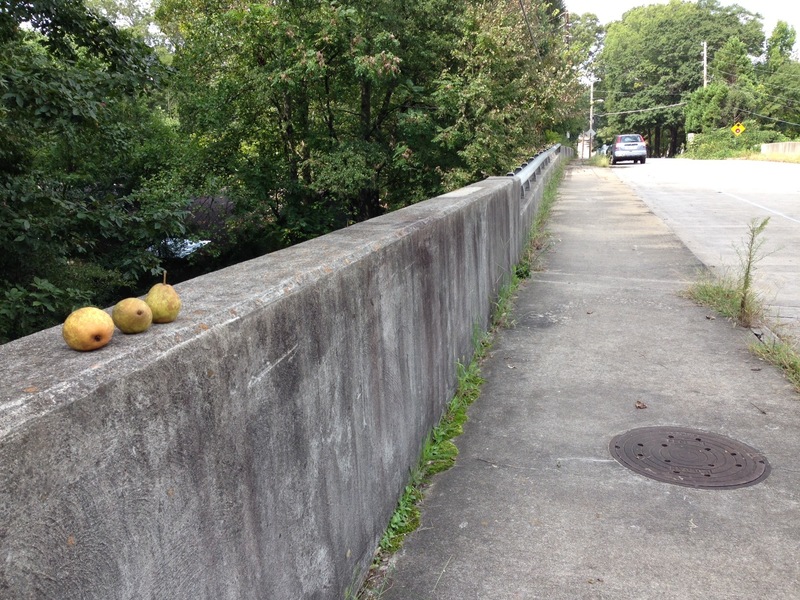 Three pears balanced on the overpass railing. Left there — why? By whom? The usual suspects, the walkers I always see at this time of morning, when I myself am walking: the smiling young man who often sports a t-shirt silkscreened to look like a tuxedo, a dapper fancy-dress that celebrates the day. Is it is favorite shirt? What is he always listening to, through those earphones? The lean saturnine man who used to just walk a Great Dane but now walks Great Dane and Baby, his slow amble mainly just to allow his dog time to nose the curb, even though I like to think it says time, time, I have nothing but time, I am home every morning with a three-month old baby. The jogger I call the Victorian Strongman, with his drooping handlebar mustache and sideburns and his springy lope. The spent-handkerchief crumple of the moonflower blooms along the fence; the snail meandering through the wet grass; the strength of my shadow as it travels the pavement. Five good things, the leavening, life’s sweet. … Since he belonged, even at the age of six, to that great clan which cannot keep this feeling separate from that, but must let future prospects, their joys and sorrows, cloud what is actually at hand, since to such people…any turn in the wheel of sensation has the power to crystallize and transfix the moment upon which its gloom or radiance rests, James Ramsey, sitting on the floor cutting out pages from the illustrated catalogue of the Army and Navy Stores, endowed the picture of a refrigerator as his mother spoke with heavenly bliss. It was fringed with joy. This morning, as I headed somewhere, car keys in one hand, iPod in the other, I found myself yanked momentarily away from my earnest, busy intentionsby a glimpse of gold peeping from the green foliage in the corner of our front yard. 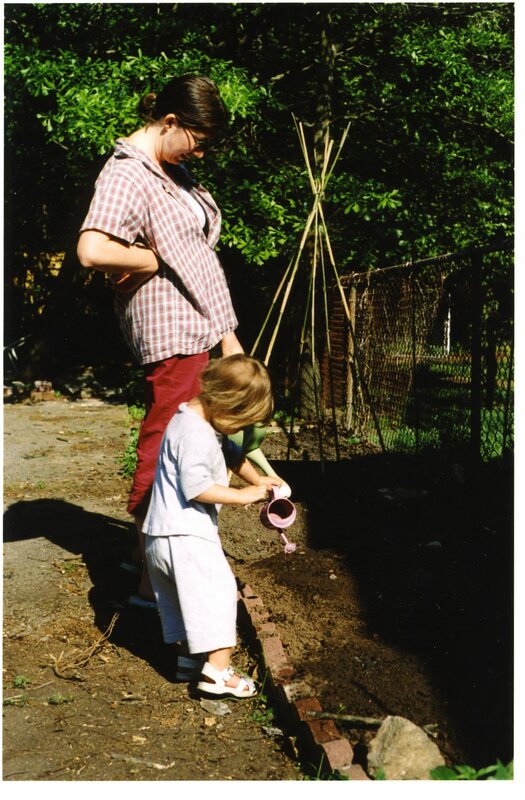 And then, before I really knew what hit me, I was balanced precariously at the edge of the raised bed we call our “garden,” plucking cherry tomatoes from the sprawling vine. It is one of the rituals — and pleasures — of my domestic life that every spring I plant tomatoes. The ritual began a year or so after we bought our first house, when our oldest was a toddler, and in the beginning, I had grand ambitions for it, as I do for most things. Tomatoes, I promised myself. Watermelon and cantaloupe. Summer squash and zucchini and cucumbers. I would feed my little family of three just like a midwestern farm wife! That first year, I started heirloom seeds I had purchased from a beautifully-illustrated catalogue . I ended up with dozens of seedlings that, lacking that midwestern farm wife’s farm, I mostly had to give away. That first year, I knew someone who had ten-acres-and-a-mule so I hauled home trash cans of black gold (i.e. manure) in the back of our newly-acquired station wagon. I nursed the seedlings along, got them into the ground; I battled horn worms. I can’t remember if the harvest that year was good or bad. In the eleven years since, my ambitions have been whittled down. On a good year, I plant tomatoes and cucumbers and beans and one of the other of them will stubbornly refuse to grow. More often, I just buy tomato seedlings at Lowe’s and slap them into the ground and hope for the best. I used to be a thoughtful gardener: now I know that things grow despite —not because of — me. Some years squirrels get all my harvest. Some years, it’s just plain too droughty, and I forget to water regularly, and the whole enterprise is pretty much of a bust. This year, I planted cherry tomatoes because I was sick of spending 4 bucks a pint for them all summer long. Sun golds and black cherries — so candy-like you could almost call them the bonbons of the tomato world. If nothing else, growing your own food is a great way to learn just hard it can be — to grow food. My garden could never — not even in my wildest dreams — produce enough to see us through a winter. Although our society is rife with inequities, certain sorts of abundance are a given. We assume there will always be cherry tomatoes, arrayed pint-beside-pint at the grocery store. And that assumption is correct. Barring apocalypse, there will be. The lesson the tomato plants in the front yard teach is that the fact that I get even a single tomato at all is a miracle. This morning, I set my business aside for a few minutes and picked tomatoes. In seconds, I had more than I could hold in my hands. I made a bowl of my t-shirt; kept picking. The plants are such an unmannerly sprawl that finding the fruit is a game of hide-and-seek. Just I think I’ve gotten all the ripe ones, I move to the other side of the bed and spy new ones. There is always just enough for dinner that night, and the next day’s lunches. The garden sings its beautiful song. It might as well be a detail from a fairy tale, the way the plants magically replenish themselves in the night and then offer up more, our everyday abundance. Must be productive, must be efficient, must keep to the schedule, the to-do list! The Summer 2013 issue of The Massachusetts Review, which includes my story “Plenty” is out and on the metaphorical stands. You can subscribe here. All those years ago, when the guy with the guitar at the blueberry farm had handed back her change, his fingers had been stained up to the first knuckle with blueberry juice. And then, on the drive home, she and John had had their first real argument — over how easy or hard it might be, to defer one’s student loans, or wear faded overalls, or be a gentleman farmer. The next morning, she had cooked down the berries while John was at work, with a recipe she’d kept when she cleaned out her grandmother’s house, spidery handwriting on a stained index card. She tilted it on the counter and set to work. Eva’s Blueberry Jam, it proclaimed, and in the right-hand margin: the best Edward says he ever tasted! Who was Eva? Edward? The house filled up with the smell of hot sugar, like a fairground. 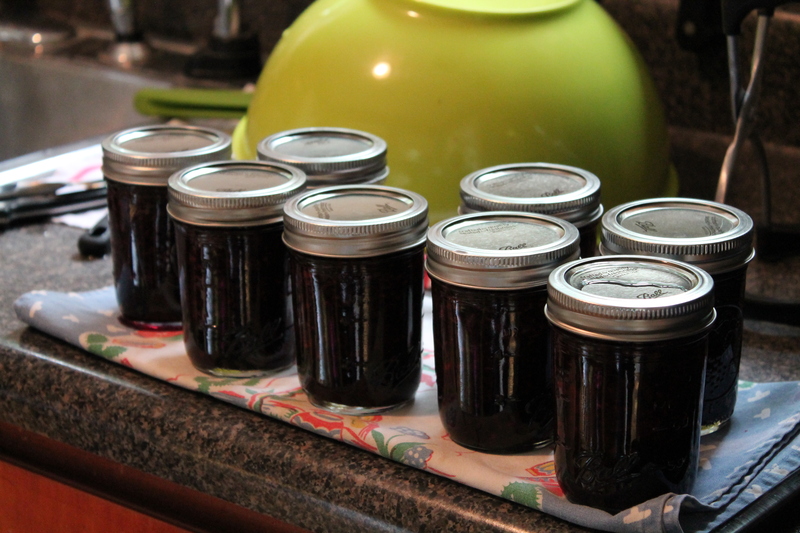 An aside: last weekend’s Blackberry-Lime Jam was just made for research’s sake, of course. And while we’re on the subject of art and craft, and magazines, when my poem “Cucumbers” was published in Ruminate this past spring, I received a year’s subscription to it. I just got the Summer 2013 issue. It’s gorgeous, both in form and content. Print, in case you haven’t heard, is pretty close to dead. Who needs ink, when we’ve got bits and bytes and vapor? The wisps of words we have do the job just fine. I’d argue otherwise. I’d like to, in fact, put in a vote for things that are tactile — for process. I won’t lie: I love the convenient jolt I get whenever I click away from the work I’m doing to read… whatever. (To be honest, usually it’s the neighborhood listserv, which no one in their right mind would call either art or craft). I can waste an hour or so letting my mouse rove from here to there and back again with the best of them. It’s so easy, for us to consume. Words and opinions, in this particular case. We eat them up. We chew them up and spit them out. And we hardly ever even have to pay for them! When we have gotten so good at attaching ourselves to the I.V. of communication, what point is there in something as old-fashioned as print and paper? But there might be something to be said — for the shrink-wrapped magazine that arrives unexpectedly on a sultry summer afternoon. For one thing, its arrival in the mailbox helps keep the U.S. Postal Service afloat. For another, the unpredictability of its arrival might actually be a sort of gift. We can summon up so much, and so quickly! We get exactly what we want. The second that we want it. So maybe it’s good for us — to occasionally be surprised. Even if it’s by something as mundane as a magazine. The day my copy of the latest Ruminate arrived, I stood at the curb and reached into my mailbox. The neighbor’s hickory tree has already started tossing down a few harbinger nuts, hints of cooler weather to come. The street was quiet, quiet. Sealed off. I tossed the mail onto the front seat of the car and backed out of the driveway and Younger Girleen and I headed off, to the orthodontist. This time last week, she and I were headed farther afield. To Western NC to pick up her older sister at camp. On the way we stopped, as we have the past couple of years, to pick berries at a farm perched at the top of a slant-sided hill. South Carolina tableland, I suppose you’d call the area, the littlest toe of the foothills of the Blue Ridge. The real hills, or their bulky outlines, hang on the horizon like a bank of clouds. We pick a gallon of blackberries from looping canes; another of rabbit-eye Blues. And then I lug them into our hotel room that night, and out again the next morning. After Big Sister has been picked up, and hugged, and we are headed homeward, we discuss: a crumble this year? A pie? Should we just eat them by the handful? There was enough for all those things. There was, in fact, plenty. Last Sunday afternoon, I brought glass jars to a boil in a black-speckled canner purchased at the local hardware store that, a year or so after the Big Box went in two miles away, gave up the ghost and went under. Thinking all the while. Of this, of that, of the way an 11-year-old’s legs magically lengthen when you aren’t there to see that 11-year-old for two weeks. Thinking also of the water required to sterilize a half-dozen jelly jars, the natural gas required to heat it, and the jar of jelly to be had at Kroger down the street. What does it cost? Two, three dollars? Every morning when we pull out our newly-minted jam and smear it onto slabs of toast, I admire its distillation of that afternoon, when I picked berries with my eight-year-old, and a hawk wheeled overhead, and I was lost in process. Our fingers touched every single berry in this jam! Younger Girleen points out. At the orthodontist, I sat in the waiting area while her titanium spring dental appliance was adjusted, magazine on lap. Fingers happy with the heft of the paper pages, the crisp ink, the middle section of reproduced paintings by an artist I’d never before known to seek out. A fool, yes, but such a happy one, on certain sultry summer days. As far as this blog goes, I’ve written about the swimming pool, that staple of summer life, here and here and here and here. In Eggs for Young America, my collection of stories, life required (among other things) fraught swimming-tests for twelve-year-old girls (“Deadman’s Float”), pilgrimages to Lake Michigan (“Grand Portage”), and nests of water moccasins encountered while waterskiing Lake Lanier (“The Gulf”). 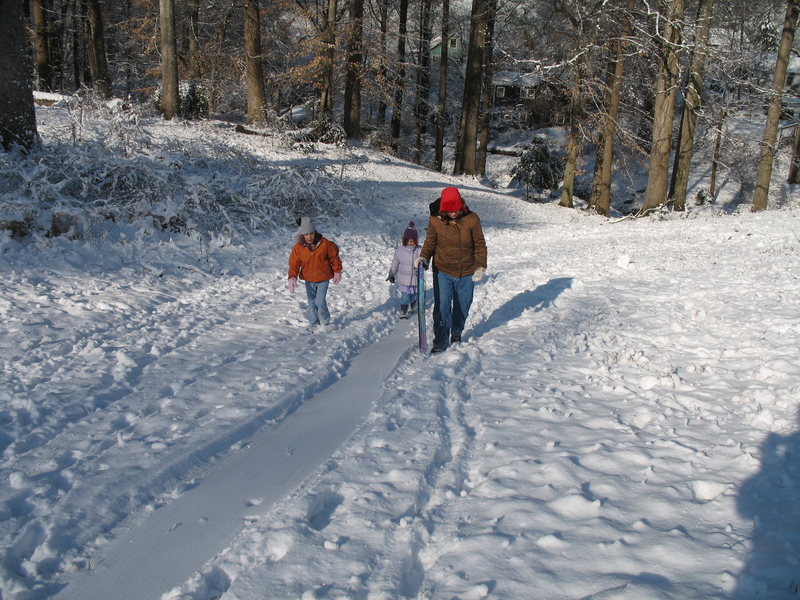 In stories since, college students covertly eye their teaching assistants as they swim laps at the university pool (“The Shoals”), people realize they’d “always preferred land to water” (“The Sailor’s Horn-book for the Law of Storms”), and teen-aged girls step out on frozen lakes with random strangers (“The Snow Queen”). On the one hand, you could look out at all this water and mainly just see evidence of the location where much of my writing takes place. It gets hot down here in the summertime; what else are we supposed to do but head to the pool or the lake? But on the other — what gives? I took swimming lessons as a child; I loathed them. I don’t think of myself as a particularly strong swimmer. What on earth is this feeling of love that suffuses me whenever I herd children away from the oblong shimmer of water that is our local pool after swim team practice? The pool itself has seen better days. Like so much else, swim team turns out to be no parental cake-walk. At the pool, our children are (we are) brave and cowardly by turns. At the pool, I have observed the slow, slow, one flip-flopped foot in front of the other perp-walk to the dressing room during the middle of practice an eight-year-old uses to avoid swimming 50 yards of butterfly stroke. I have seen spent ten-year-olds gamely tackle distance you can tell they believe is insurmountable. I have seen college-kid instructors kicked in the face over and over and over again by flailing toddlers while three of that toddler’s peers sit on the edge of the pool engaged in the low-level, I-can-do-this-with-one-hand-tied-behind-my-back-and-forever, fretful crying that finds every chink in a watching parent’s armor. I have seen (I have been) the parent who relents and wraps a kid in a towel and takes them home early; I have seen (I have been) the parent who turns their face away so as to not see the pleading look of the kid who wants to be rescued from a lesson. I have sat on the lounge chairs purchased with neighborhood donations because the city can’t (too poor? too mismanaged?) afford them and languidly discussed swimming holes in the Great Smoky Mountains and how to make peach preserves and inexpensive house painters and neighborhood crime. At the pool I have been the sort of snappish, harried parent I hate. I have also — for brief tiny seconds — been the generous inverse of that. At the swimming pool, the water, acrid with chlorine, sluices away our defenses. At the swimming pool, we all are naked, and that is always a beautiful thing. If you classify yourself as a “reader” in the simplest sense of the word (ie, one who reads), and probably even if you don’t, sooner or later it happens — you find yourself on the tour of the House of the Famous Writer. More specifically, you find yourself peering over a velvet rope into a particular room that long ago was pressed into service to become a famous writer’s workspace. What transformed it from a dining room or a bedroom or a hall closet into a space where genius burned? A typewriter, of course, and the desk on which that typewriter sits. Books, stacked in teetering piles on every surface, or tucked into bookcases, floor to ceiling. I see a sign for the Writer’s House as I’m on my way from Here to There, and anything has become a great excuse to get out of the car (ie, Carl Sandburg’s House, where I was most impressed by the fact that he raised goats, which seems in many ways a more sensible (and lucrative) profession than writing)*. Now, I write in a room that was once a porch and was glassed-in by previous owners, nominally at least. The aluminum casement windows that prove just how long ago it was glassed in were like some red carpet for tiny spiders — man, the bugs just sauntered in. The space is cold in winter, hot in summer — or at least it was until recently, when an “incident” that caused an apple from our front yard tree to fly out of an older sibling’s hand and miss the intended younger sibling target***) spurred us to go ahead and get “real” windows to replace the “fake” ones. Now my writing room is, in fact, a room. It’s a room that also contains a bicycle and crayons scattered across the floor like so much tinder, but it’s a room, all the same. The windows perform as intended, and in an added, unexpected benefit, also serve as a lovely frame, now and then transforming the everyday into a form of artwork. 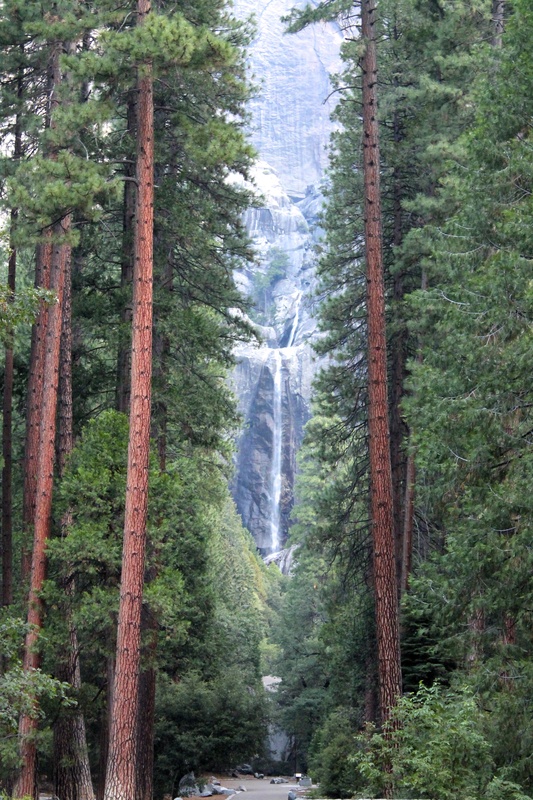 Would it be too tired a cliché to say — maybe sometimes you notice more when your view has been just a bit constrained? We are on the cusp of fall. Four days ago we were still wrestling with the draggling tag-end of a long hot summer, but the temperature has finally, mercifully, just in the nick of time dropped. The leaves of the hickory tree to be noticed through the windows are still green, drought-limp and still, and waiting, waiting. Drowsy, and they dream of falling. We have passed into a new season. Two children in elementary school! This transition might contain one of parenthood’s great secrets: once all your children are in school, you get some of your life back. And this secret is so secret exactly why? Because admitting you might have once had some sort of life you long to regain marks you as —what? — a dreadful, dreadful traitor? Our mornings are different than they used to be. By third grade, clothes matter, at least to girls. Hair sometimes refuses to do what it should! Things are misplaced; schoolwork left undone! Let us bow our heads, engage in torrents of loud weeping! Last night I dreamed one of Elder Girleen’s peers arrived at school in three-inch heels and c-cups. It’s that non-organic milk, I tried to assure myself and woke up in a cold sweat. The corollary to the fact that I am regaining something of my old life is that I also have new work to do: to give my daughters, who no longer need me quite the same way, their lives. We have passed into a new season. The childless on the neighborhood e-list are stewing over Halloween. So many children! They knock on the door uncostumed! They’re van-loaded in from Henry County! Sometimes they hit the same houses twice! They’ve been raised wrong! We have passed into a new season. Early mornings, the middle-schoolers bike to their school in the center of this neighborhood, toiling up the hills and coasting down, in a scarfed and bundled pack. Today, a straggler was pedally madly, desperately, to catch up. Around the corner behind her, one last cyclist. The straggler’s dad. He’s hanging back, but oh, he’s there. I was walking by; I saw it. I fiddled with the ipod tucked into one jacket pocket, turned the volume way way up, loud enough to drown out the voices on the neighborhood e-list who’ve deemed such behavior an unsafe, subversive act. Oh brave new world! O brave new season! Miraculously, my children are changing. I pray — to what? To whom? Unknown —for the wisdom to change with them, and walk on. *The second thing I was impressed by was the “napping couch” beside Sandburg’s desk — what rosy times there were then! ** Given how often dining rooms are pressed into service as writer’s workplaces, I suppose a conclusion could be drawn about the ability of words to serve as nourishment, but I’d really rather wax eloquent about goat-farming. The end of May. The sinister, slightly noirish fragrance, of jasmine, of gardenia — those funereal white flowers that always make me think of Raymond Chandler novels and the L.A. of the thirties — moves toward me in eddies early mornings when I walk through the neighborhood. Overwritten? Yes — but also true. The end of May. Two seasons ago — September October November, I can’t quite conjure up the feel of those months anymore, it being somehow impossible to inhabit a previous season once the weather’s moved past it — the front yards I walked past were sere and brown, most of their landscaping transformed into dry rustling seedpods. The whorled catherine wheels of clematis; strange haired globes that split open to reveal seeds as polished black as buttons. 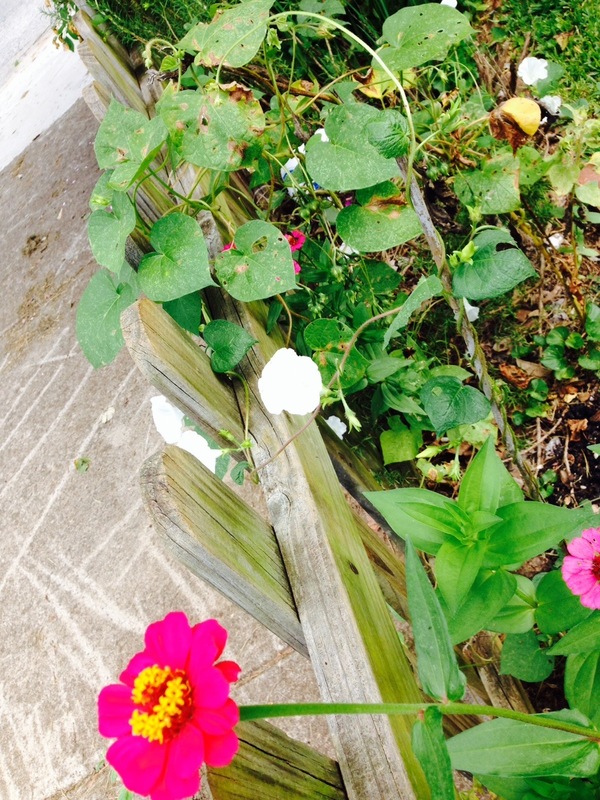 I carried them home in my hands; I cast them into the flower beds that line our picket fence, and then I forgot them. Now they’re blooming and I am, in fact, surprised. The feathery foliage and purple spurs so Victorian in their delicacy that must be larkspur — were they last fall’s work? The hollyhock stalk grown almost as high as an elephant’s eye — where did it come from? Did I mean to plant it? End of May. For weeks, I’ve been maligning the mockingbirds that selected the arbor over our front gate as their nursery. It took them over two weeks to construct a nest the internet said should take two days. Their results were from my critical point of view, slovenly. Their approach to nest-sitting resembled the Mayzie Bird’s in Horton Hatches the Egg. They were there for an hour or so for a day or two, and then disappeared, as far as I could tell. Surely a clutch of eggs required more nurturing than that! I held on to my story: that they were teenagers on their first procreative trial run, learning the ropes. The whole event was a bust. Or was it? Today they’re back, and flying in and out of the akebia that covers the arbor, bearing worms. Satisfied with a job well done, one sits the centermost picket of the gate below the arbor, opening and closing its wings, looking like nothing so much as a bird automaton. I suppose it doesn’t do — to make judgements on the parenting ability of anything, bird or beast. Snow flurries 48 hours ago but winter’s at last behind us: when I drove the Girleens to school soon after sunrise this morning the white haze of the Bradford pears hung above the slopes and redoubts of nearby Grant Park like smoke. Trash trees, those Bradford pears, horticulturalists don’t particularly like them. But the exact second the Bradford pears begin to paint Atlanta with that pale green and white wash, spring is come. How on earth do they do it? For a few days in early spring, their blooming’s somehow demure and excessive both, and at that moment Atlanta is — for me — at its most heartbreakingly, seductively, southern. The azaleas this neck of the woods is known for bloom a few weeks later, but they might be a tad too frilly and flamboyant. And what are April’s dogwoods, really, but the classiest of clichés, lending to the most litter-ridden Atlanta neighborhood a chinoiserie and elegance it probably doesn’t deserve? But those Bradford pears, they’re impulsive. Sometimes they come too early, and we’re still busy bundling up against the cold. But mostly, they know how to seize their moment. Which is right now, this instant. The leaves about-to-come are an insistent whisper caught up in the trees. A pair of summer tanagers just took dot-and-carry flight across the yard. Last night, a pair of barred owls sat the oak outside our windows— who cooks for you who cooks for you? they demanded to know, and in the face of that question, what else could we do? We took the girls outside in their pajamas to see the owls’ odd, monkey faces peering down: we looked at them and they looked back, and in that minute all was right with our world. The tailings of November, when the sky takes on the character of dingy cotton batting and the air smells of newly-cut lumber from the house rising on the corner, and the yellow-and-black sign plunged into the front yard two doors down from it speaks volumes: Bank Owned. Auction. The tailings of November and the trees have at last disrobed. I find myself enamored with the elegant scaffolding this time of year reveals. At the corner of Hemlock and Berne a hornet’s nest is beached in the uppermost branches of a crape myrtle: the branches shed of leaves are polished bone, the nest like wadded, unbleached linen. The day after Thanksgiving we drove further than we should have, a lunch of leftovers packed into the trunk, spurred on by visions of waterfalls and the promise of fossils to be found on the side of the road. The spoil heaps where they once could be hunted were festooned with with No Trespassing signs that kept us in the car, but later, on the path that led us toward the roar of the waterfall, we found a small discarded nest, fetched up against one piling of the guardrail. Neither the haphazard stucco’ing of mud robins resort to nor a mockingbird’s thatch of sticks, it was threaded through with pine needles and delicate dried stalks, the embroidery of it french-knotted here and there with tiny seed heads. We packaged it up carefully into the tupperware that had held slices of apple; we picked up shale and talked about the way there could be the the ghost-images of plants pressed into its layered pages; we watched the water sluicing from the lip of rock above us, and threw rocks into the creek solely for the glory of their splashing.